What an excitement yesterday! 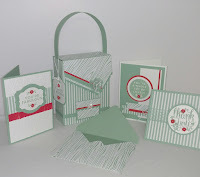 The Creative Circle Designer Team blog hop was so much fun and I can't wait to share with you for the next month. In the next couple of posts, I will reveal my cards and how I incorporated them with the Murse Pattern (Man-Purse). The first card started off with a 5-1/2" x 8-1/2" with delightful dijon cardstock, scored at 4-1/4". I rounded the right top and bottom corners with a corner punch and them embossed it with our beautiful Boho Chic Embossing Folder. The large flag piece was cut at 1-1/2" x 5-1/4" and I punched the bottom with using the triple border punch and adhere to the base card. Next, I cut another designer series paper at 1/2" x 4-1/4" and I used the triple border punch again. (TIP: turn your punch upside down so that you can view the centre point) and adhere it to the base card offsetting it slightly to the right. The focal point, I cut a 1" x 2-1/4" of whisper white cardstock, then I stamped the diamond with versamark ink and heat embossed with black embossing powder. Once that was set, I repeated the process by aligning the second diamond on the bottom of the other stamped image and heat embossed with black embossing powder and then trimmed the excess off, and adhere to a remnant basic black cardstock at 1" x 2-1/4". I then used dimensional to pop up the image. I then used pacific point and daffodil delight markers to color the focal point. Want to make a Murse? A FREE download pattern is available. Click on the link below. Here is my team's take. Inside scoop - Join my team InkRedible Crafters Team and I will get you started. My InkRedible Crafters Team receives my 3D patterns FREE.